This diary have live malware links, so be careful if you decide to access them. 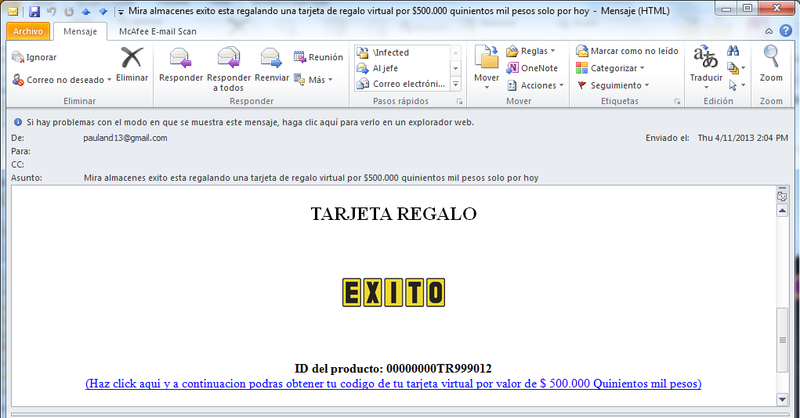 Spammers are busy this week in my Country! Today april 11 2013 I received a spam claiming to be a promotion from the biggest retail company in the country and statng that they are giving for free debit cards for US$274.54. After analyzing this little thing, it turned out to be a koobface variant. Virustotal detection rate is pretty high (36/42), but as I stated in my previous diary, too many people around here does not like to install security controls inside their computers because they do not allow them to use insecure programs or they just think that investing in antimalware / HIPS licenses is not worth it. Firewall Software: Windows Firewall is good but lacks advanced functions that really can enhance the protection of your information assets. Host IPS: Most 0-day vulnerabilities can be catched with this protection since it catches buffer overflows and common malicious operations performed by exploits to gain privileges or perform malicious tasks inside your computer. The above basic security controls are valid and have stood the test of time (>20 years). Unfortunately, the recommendations are often costly and generally impair system performance. A more acceptable option is to select a messaging service provider that offers content inspection as well as malware detection. More importantly, exercise caution when opening messages, attachments and following embedded links. In short, practicing rudimentary information security precautions. I'd rather have slightly-slower systems than have to spend _my_ time nuking compromised systems and rebuilding them. Besides, when's the last time that your "standard" new PC, with dual-cores and two threads per core, ever ran at 100% CPU for enough time for you to notice? It's time to buy a new computer, to replace your Pentium 166 Mhz CPU.